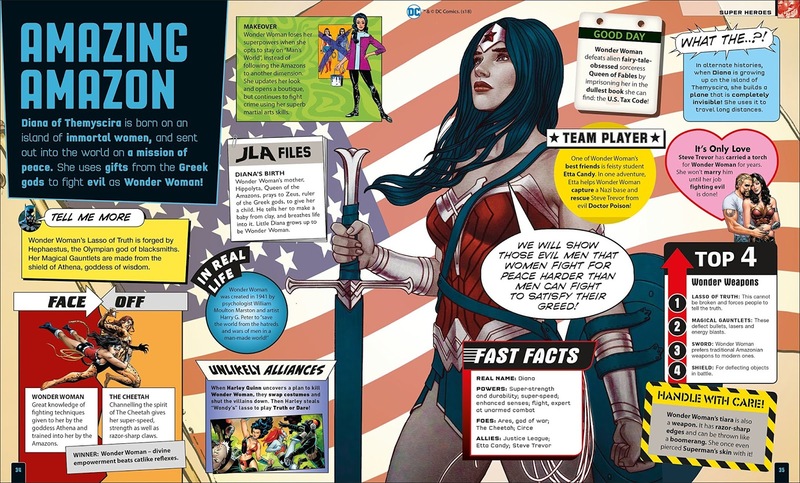 Do you think you know everything you need to know about the DC Universe? 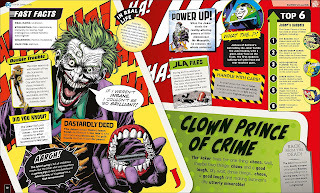 If so, then think again, because DK have recently released a brave and bold book that's filled with so many facts and figures it would even bring a smile to The Jokers face. Trust me, fellow comic book fans, this book is the bomb. Not a literal one, of course. Otherwise, Mister J's grin would also go from chin to chin, and unfortunately, the top of his head would fall off, Ha! 1) When he was young, Superman put out a fire in Lex Luthor's lab, but accidentally spilled some chemicals which caused Lex to lose his hair! Still, think of all the money he saved over the years not needing to buy shampoo! That's most probably why he's a millionaire. 2) Bruce Wayne probably saves more lives through the Wayne Foundation than he does at being Batman. In fact, being Batman is so unnecessary, that I best shut up before he tracks me down and kicks my face in. Batman rocks!! 3) The Tamaranean race, who are an ancient alien race that live in the Vega System, have lost at least three homeworlds within the last one hundred years. No wonder Starfire, one of their kind, now lives on Earth! 4) The Flash's Rogues Gallery once defended Central City when the scarlet speedster went missing in action. Well, when I say missing, I should most probably say hungry and needing a snack. Allegedly. 5) Catwoman is so agile she once managed to outmaneuver a hail of bullets. But then again, the gunman probably lost focus when he saw her cleavage. 6) Green Lantern once said, 'I'm going to hit him really, really hard with a big green boxing glove'. Do boxing gloves come in green? 7) Aquaman can control most of the creatures living in the sea, except piranhas, who once bit off his hand. So, presumably, he had a bit of a problem picking his nose and wiping his... NEXT!!! 8) The New God named Darkseid weighs approximately 823kg. But don't tell him that I told you this, or else he might sit on me. 9) When Wonder Woman made her first appearance in All-Star Comics #3, circa 1940, she was depicted as being the secretary for the Justice Society of America. Tut-tut-tut! Didn't they have women's lib back then? 10) The Preston Payne version of Clayface once had a long term relationship with a mannequin. So, no #metoo movement for him, eh? Anyway. That's enough of that, dear reader, because something else about this book I would like to mention is how I thoroughly enjoyed it's simple and easy approach at conveying information. 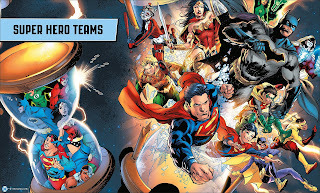 There are five chapters in total, and each one is focused on The Characters, The Teams, The Locations, The Multiverse, and The Science and Magic, with each chapter then broken-down even further to specify a more specific subject or person of note. I also enjoyed the leisurely yet formal style this book appeared to conform to. 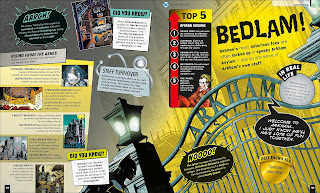 In many ways, it's a great book to read if you don't want to follow a narrative but do want to be entertained, which I was, big time, and would highly recommend it to those DC fans out there that like the same sort of thing. Authors: Liz Marsham, Melanie Scott, Landry Walker, and Stephen Wiacek. Age Range: 8 years and over. 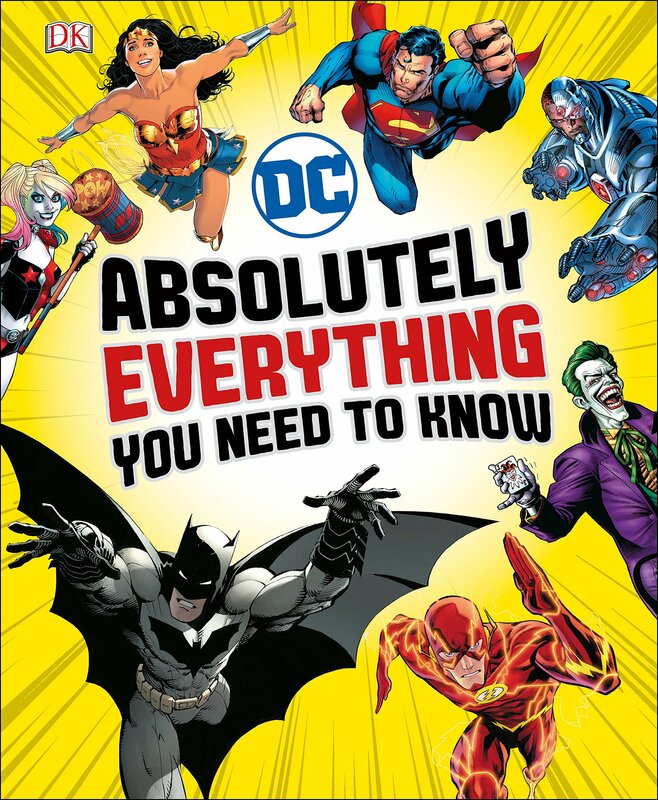 Synopsis: 'DC Comics Absolutely Everything You Need To Know', is a punchy, factoid styled book, that's designed using similar principles you'd see on an infographic. 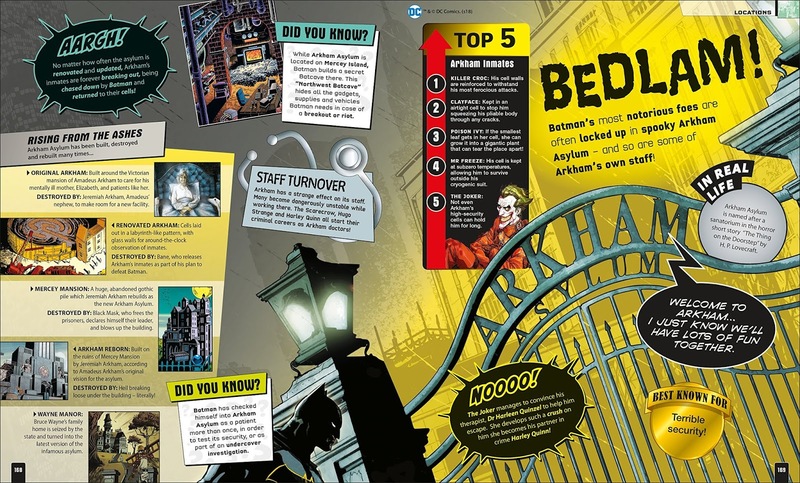 Each page is expertly illustrated in a very bold and eye-catching fashion, and they generally sport fun facts, illuminating information, and tantalizing trivia about the people who populate the DC Universe. So go ahead, pick up this book today and discover Superman's strangest powers, Batman's smartest escapes, and the greatest secrets of Aquaman's undersea kingdom! What's more, you can also explore the darkest corners of the DCU and see eye-popping revelations and quotes that will inform, delight, and enthral DC Comics fans of all ages. For more information, please don't hesitate to check out DK Books on their website, facebook, and twitter pages.